So life is crazy, and there are some days when you wake up in Dubai, and take a bus ride out into the desert, and then drive the car that won the toughest race in the world, the Dakar Rally. And I don’t mean a car like the one that won the Dakar Rally. I mean the exact car. This is the Mini All4 Racing (or whatever name BMW affixes to this all-custom rally machine) that won the 2015 Dakar Rally, covering over five and a half thousand miles of mountains and dunes and deserts and river crossings and fatigue and breakdowns and bumps and jumps across South America. It’s more than a little intimidating to get strapped into the high-riding car, and let loose into the dunes of the United Arab Emirates. I cannot even begin to consider the consequences of a major fuckup. This car is normally driven by Nasser Al-Attiyah (a contender for real-life World’s Most Interesting Man) and he will be racing this vehicle a week after I drive it. Nasser is a very nice man. I met him the night before. But I also know that Nasser is an Olympic marksman. And I know that the UAE very much has the ability to imprison Western idiots like myself. And I don’t want to get shot in the face and left to die in the desert. But I put that thought in the back of my mind, so I close the carbon fiber door and I set off into the dunes. Here’s what’s weird about driving the Mini; it’s really, really easy. This isn’t just the easiest race car I’ve ever driven, it might be the easiest car I’ve ever driven. I had a harder time getting used to the clutch in my buddy’s old ‘81 Honda than this Mini, the very pinnacle of modern long-distance off road racing technology. The steering is direct, but not heavy. The car communicates very clearly what it’s doing and where it’s comfortable. You can feel the texture of the surface under the tires, all of them driven by a four-wheel drive system with a manually-locking center differential. The engine is a three-liter straight-six turbodiesel, so it’s really smooth and there’s tons and tons of helpful torque. At one point I rise up onto the crest of some small dunes (they call them dunettes) without quite enough speed. I just mash the throttle and the whole car surges up the incline, in sand as soft as fresh powder. The suspension might be the best part of all. You get two shock absorbers at each corner of the car. They’re remote reservoir shocks, so they work just as well over low-speed rocks as they do thundering over washboard whoops at 120 miles an hour. Honestly, the technology in the suspension feels like black magic. The Mini absolutely handles offset ridges under full throttle, and settles itself instantly after bouncing in the air over a more serious ridge. After plowing through a few wide, sweeping turns, and bowling through a few tighter hairpins, my co-driver yells at me. He’s Andi Schulz. He has been co-driving for four decades, and has coached many drivers from upstarts to Dakar winners. “Don’t turn it like a rally car!” comes over the intercom again. I’m being too sharp at the wheel, too exaggerated. This Mini is built by a company called X-Raid. It’s all custom, with a steel tube frame and a carbon fiber body. Even with its extensive lightweight construction, the Mini is a two-ton machine. It doesn’t like to be rushed. Saw your way through a corner and it starts to feel like a truck, plowing and heaving in the sand. Give the Mini neat little adjustments and it comes back to you. The four-wheel drive feels like it’s digging into the ground itself. I guess it is, actually. There’s a distinct sensation that the Mini is actively helping me through the corner. There’s some very serious engineering involved in that kind of character. The engine is mounted somewhere behind the front wheels, about in line with the suspension. X-Raid’s head mechanic refused to show me its exact location, the only secret he kept. The transmission is mounted behind and in line with the engine, practically resting on the floor of the car. It also serves as the transaxle and is covered in hydraulic and self-oiling lines. What this means is that while the car is heavy, all the weight is very low, and the center of gravity is quite good. It turns and transitions and handles terrain with what you could almost call poise. As I said, it all adds up to a car that’s shockingly easy to get in and drive. But I can’t really say it’s easy, because after two quick dunettes leading into a sharp right hand turn in ultra-soft sand, I get the X-Raid Mini stuck. When Andi and I are barreling down a flat expanse of desert floor, there’s really not all that much I need to be concentrating on. There’s the suede-wrapped steering wheel and there’s the tall sequential gear lever. Pull back each time the engine rises up towards its three thousand-something rpm redline and you get another gear. It’s not any more complicated than that. I’ve never driven out in open desert like this, but the Mini is inspiring some personal confidence. But then we re-enter the dunes for the second lap of our test route and things get more complicated. I shift from fifth down to third and into the first rise, then “slow, slow” over the intercom for the second blind crest into the right turn. There is a moment — the heat, the excitement, the buzzing engine and the suspension soaking up our last not-quite-airborne heave. We crest again. I see the upcoming curve. Aaaaaand then I pull for fourth rather than push for third. The Mini lands perfectly composed but the engine bogs, and the wheels sink, and we’re stuck. I try and drive us free. Andi begins playing with all of the mysterious buttons and levers on the car. I later realize he’s locking the center diff and managing lord knows what other systems, but the car won’t move. We’re only sinking deeper into the granular sand. It is so soft. Imagine freshly fallen snow, but dry and baked to a hundred degrees plus. I get out. Andi takes the wheel. Andi can’t drive out. Andi engages the Mini’s onboard pneumatic jacks and I fill in the holes the wheels sunk into. The car only sinks further until it is beached. Andi does not call for a tow out here in the desert. We are driving out of this one way or another. He unlocks the back hatch and we get out grippy metal platters to place under the wheels. Both on our knees in the hot sand, driving suit on and all, we dig sand out from under the (once again) jacked up car. It feels particularly strange to be crouched beside a Dakar winning codriver, beneath a Dakar-winning car, out in the blue-over-beige expanses outside Dubai. To say it is otherworldly would be an understatement. We fill the holes made by the spinning wheels once more and stick the platters ahead of the wheels. Andi retakes the driver’s seat and defiantly drives free from the mess. I joke about us playing around with our shovels like a nice day at the beach. He gives me back the driver’s seat and we continue on. For some reason and I don’t know why, he has me go for another lap. It’s one more than others seemed to get. My nerves are wracked after getting stuck. And it’s weird, because the Mini’s suspension is so good, and the center of gravity is so low, and the engine is so torquey — the car remains really, really relaxed to drive. You only need to stop driving it like a rally car or a formula car or any other race car you’re used to. Start driving it like a truck and it becomes and almost serene kind of experience. We get back to Mini’s bivouac and I begin to feel bad that I couldn’t have had more time to get things better in the car. Then I get a ride with one of the professional Dakar racers, and I realize that even if I was there for a week, even if I was there for a year, or five years, I would never drive like they could. It’s like the Mini is driving up sheer walls and down straight cliffs. 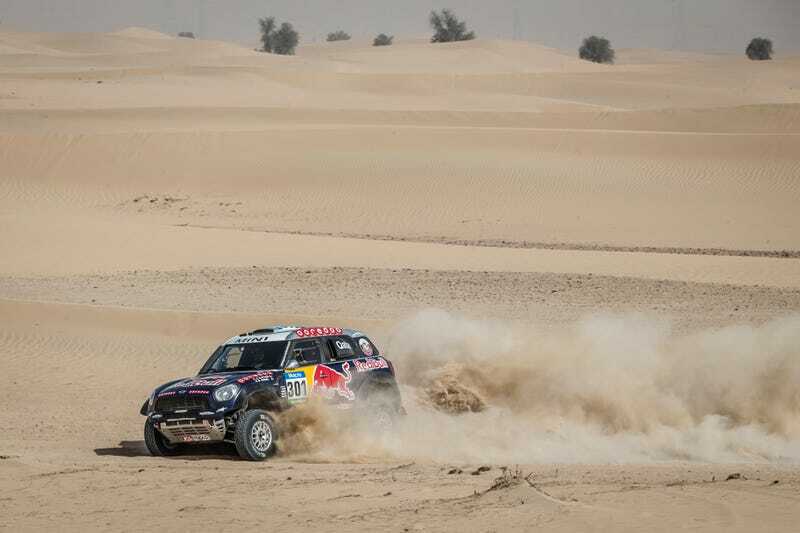 Nobody under the age of 35 has won the Dakar. It’s all about knowing what the terrain and the car can handle. It’s about redefining your human limits. This Mini is built so strong, and racing in the desert is so tough, that the human becomes the weakest part of the equation. That’s what the Dakar drivers know, and that’s what I found out in my little dunettes. The human’s limits show up long before the vehicle’s. My heart still aches when I think about this Mini. It’s built to be fast, sure, but it is built just as much to be strong and simple and capable. Maybe the sun baked my brain out there in the dunes, but I think about this Mini and I feel humbled. I don’t know how long it will remain in my mind. A giant. The easiest car I’ve ever driven, better than I will ever be.